The Washington Post has a fascinating article about a new study of canine behavior. New research is adding to the growing evidence that man’s best friend thinks a lot more than many humans have believed. The provocative new experiment indicated that dogs can do something that previously only humans, including infants, have been shown capable of doing: decide how to imitate a behavior based on the specific circumstances in which the action takes place. In the study, researchers provoked dogs to imitate behavior that provided a treat. Under normal circumstances, dogs manipulate things with their mouths, not their paws. This experiment tested to see if dogs could learn to practice an unusual behavior — pulling a bar with a paw instead of the mouth — through imitation, and under what circumstances the imitative behavior might occur. The article concludes with a debate on whether dogs are self-aware. As a follow-up, The Washington Post featured an online chat with reporter Rob Stein and with Marc Bekoff, author of The Emotional Lives of Animals. There are 2 reader responses to "Dogs Employ Selective Imitation". 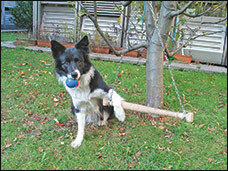 Here’s an interesting dog:Rico the Border collie.He knows the names of 200 different toys.check it out online. I am unsurprised to see that the dog in the picture is a Border Collie! BCs are very, very intelligent, and few BC owners would be shocked (as the scientists claimed they were) to see their dog using paws like that. Mine has been using her paws to manipulate things since she was a pup, and a combination of her paws and mouth for more complex tasks.